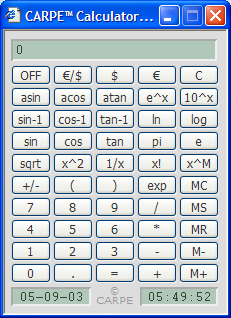 Calculator ZF 1.6 Similar to the newer ZF 2.0. 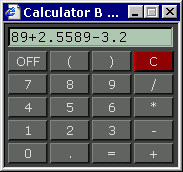 Calculator ZF 1.5 Similar to the newer ZF 2.0, but without cookie memory. 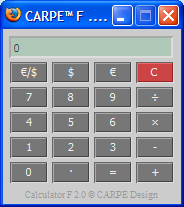 Calculator F 2.1 Basic calculator with currency converter. This version has 20 buttons and one lcd-style display. Keyboard and/or mouse may be used to make entries. The currency exchange rate is stored as a cookie. Calculator F 2.0 A variation of version 2.1 above. 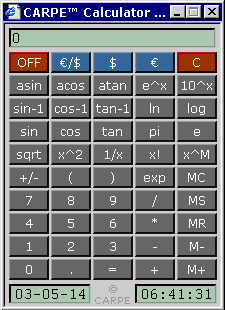 Calculator F 1.3 Calculator with memory function, date, time, and currency converter. 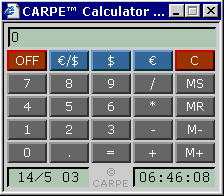 This version has 25 buttons and three lcd-style displays. Keyboard and/or mouse may be used to make entries. Currency exchange rate and memory is stored as a cookie. Calculator B Basic calculator with lcd-style display. 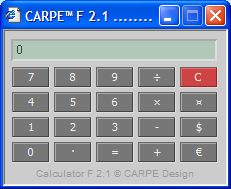 Any of the calculators above can be implemented in different ways. You can embed them in a html file or you can access them from links that open a new window. 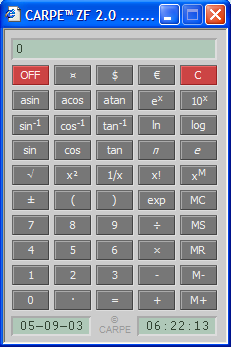 With a calculator bookmarklet you can add a calculator to your favourites/bookmarks menu. 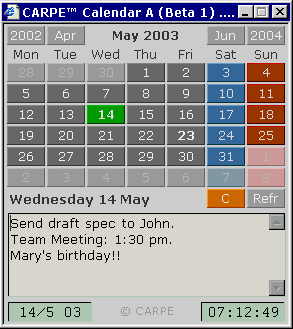 Calendar A (Beta 1) Basic calendar with cookie-based storage and lcd-style time and date displays.